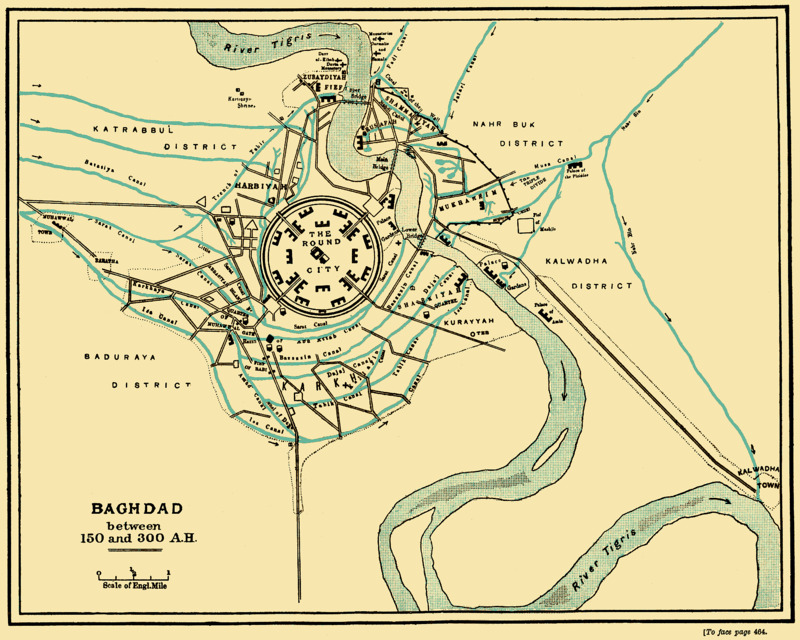 The Round City of Baghdad, constructed by Abbasid Caliph al-Mansur and illustrated above by Naji el Mir. Today's post, taken from an article on Foreign Affairs, critiques the myth of the Caliphate as an enduring political institution. But honestly if any aspiring Caliph wants to rebuild a city that looks like such a cool, perfectly geometric map of itself I fully support them. The caliphate’s more recent history under the Ottomans shows why the institution might be better thought of as a political fantasy—a blank slate just as nebulous as the “dictatorship of the proletariat”—that contemporary Islamists are largely making up as they go along. (If it weren’t, ISIS could not so readily use the same term to describe their rogue and bloody statelet that Muslim British businessmen use to articulate the idea of an elected and democratic leader for the Islamic world.) What’s more, the story of the Ottoman caliphate also suggests that in trying to realize almost any version of this fantasy, contemporary Islamists may well confront the same contradictions that bedeviled the Ottomans a century ago. When the Ottoman Empire conquered Egypt and the Arabian Peninsula in 1517, Sultan Selim the Grim officially claimed the title of caliph for himself and his heirs. In addition to taking control of the cities of Mecca and Medina, Selim bolstered his claim by bringing a collection of the Prophet’s garments and beard hairs back to Istanbul. Centuries after the fact, the Ottomans decided that they needed to make the whole process look a little more respectable, so royal historians began to assert that the final heir to the Abbasid caliphate, living in exile in Cairo centuries after losing his throne, had voluntarily bestowed his title on Selim. More practically, the Ottomans buttressed their claim to Islamic leadership by serving as guardians of the hajj and sending an elaborately decorated gilt mantle to cover the Kaaba each year. To put the title grab in perspective, when the Ottoman Sultan Mehmed II conquered the Byzantine capital of Constantinople 64 years before Selim conquered Egypt, he had claimed the title Caesar of Rome for his descendants. To the extent that being caliph had any more purchase than being Caesar for the Ottomans in the late nineteenth century, it was largely the result of a political campaign on the part of Sultan Abdulhamid II to rally anticolonial sentiment around the Ottoman state and to boost his own domestic legitimacy. His techniques included seeking to have his name read out at Friday prayers and distributing Korans around the Muslim world from Africa to Indonesia. There is no doubt that many Muslims, faced with the triumph of European colonialism in their own countries, did come to admire the idea of a pious and powerful leader like the Ottoman sultan defying Western imperialism on behalf of the entire Muslim world. Certainly, British and French officials expressed increasing fear about his potential power over Muslim colonial subjects in North Africa and India. Although he was eager to try to leverage such fears, however, even Abdulhamid had his misgivings about how much real influence his efforts won him in such far-flung locales. But in either case, the violent politics of the early twentieth century quickly outmatched theology. Despite his best efforts as defender of the faith, Abdulhamid kept losing territory and political power to Christian imperialist forces. That helped the secular leaders of the Young Turk movement, such as Enver Pasha, sideline the sultan and take power for themselves on the eve of World War I. When the Ottoman Empire then enjoyed some military success, belatedly holding its own in the Second Balkan War, Enver became an inspiration to the Muslim world. Indeed, the list of babies reportedly named after him at the time includes Enver Hoxha, the future leader of Albania, and Anwar al-Sadat, the future leader of Egypt. At the same time, the decline of Ottoman power before, during, and after World War I loaned increasing credence to the idea of a new, non-Ottoman caliph in the Arab world. But it was never entirely clear just who that Arab caliph would be. The result was that when Ataturk finally abolished the institution of the caliphate in 1924, there was no clear or coherent outcry from the Muslim world as a whole. Many Muslims, particularly those in India for whom pan-Islamic symbols such as the caliph were an important part of anticolonialism, protested. Others were more interested in maneuvering to claim the title for themselves. Several years later, Husayn’s son Abdullah—founder of the Jordanian monarchy—would declare that, in ending the caliphate, Turks had “rendered the greatest possible service to the Arabs,” for which he felt like “sending a telegram thanking Mustafa Kemal.” Of course, Husayn’s plans didn't come off exactly as expected. Despite getting British backing for his scheme early in the war, he famously fell afoul of the Sykes-Picot Agreement. The French drove his son out of Syria, and before long, the Saudis drove him out of the Arabian Peninsula. By the time Husayn officially declared himself caliph, supposedly at the insistence of a select group of Muslim leaders, his power had dwindled to the point where the declaration seemed like an act of pure desperation. The Egyptian monarchy, meanwhile, had a claim of its own to advance. Despite being closely aligned with the British and descended from Circassian Albanian ancestors with no tie to the Prophet’s family, King Fuad covertly put forward his case to succeed the Ottomans. In the words of one Islamic scholar, Egypt was better suited to the caliphate than, say, a desert nomad like Husayn “because she took the lead in religious education and had a vast number of highly educated and intelligent Muslims.” King Idris I of Libya also seemed to consider making a bid for the title but, like Fuad, ultimately decided he had too little support to do so officially. Saudi Arabia’s King Saud, despite eventually seizing the Holy Land from Husayn, was one of the few leaders who never put forward a claim to the caliphate, although the idea was certainly discussed. Saud was aligned with the Wahhabi movement, which arose as a rebellion against the supposed decadence of the Ottoman government in the eighteenth century. Ironically, although his opposition to the Ottoman-style caliph was shared by other Arabs, his particular brand of religiositywas too radical for him to ever think he had much chance of becoming caliph himself. In the end, though, the unseemliness of such political wrangling was just one of the factors that helped put the caliphate discussion to rest for the next several decades. Many Muslims had responded to its abolition by redoubling their efforts to build secular constitutional governments in their own countries. Indeed, some of the strongest opposition to the Egyptian king’s caliphal aspirations came from Egyptian liberals who opposed any moves that would increase the monarchy’s power. Egyptian scholar Ali Abd al-Raziq, in his famously controversial criticism of the very idea of a caliphate, even went so far as to claim that the Koran contains “no reference to the caliphate that Muslims have been calling for.” This was also the period where a number of thinkers, secularists and religious Muslims alike, began discussing the possibility that the caliph should be a purely religious figure, like an “Islamic pope,” unencumbered by any temporal power. It would be a mistake to think that twenty-first-century Islamist movements trying to revive the caliphate are doing so in the name of a clear, well-defined Islamic mandate. Rather, they are just other players in a centuries-long debate about a concept that has only occasionally taken on widespread relevance in the Islamic world. The legacy of earlier rounds of this argument can still be felt today. It is no surprise that, as a historical inspiration, the Ottoman caliphate holds most sway among Turkish Islamists, whose nostalgia owes far more to the way Turkish nationalists have glorified the empire than it does to the piety of the sultans. Conversely, the religious legacy of Abd al-Wahhab’s eighteenth-century critique of the Ottoman state, combined with the political legacy of more recent anti-Ottoman Arab nationalism, gives plenty of non-Turkish Islamists ample reason to prefer the precedent of an Arab caliphate. By treating the Ottoman caliphate as the final historical reference point for what current Islamists aspire to, Western pundits conflate the contemporary dream of a powerful, universally respected Muslim leader with the late Ottoman sultan's failed dream of becoming such a figure himself. The circumstances uniting these dreams—and the appeal of strong religious power in the face of Western political, military, and economic power—may be the same. But so are the challenges. Contemporary claimants to the title of caliph may quickly find themselves in the same boat as Ottoman caliphs. Political or military success, rather than history or theology, can bring short-lived legitimacy, but failure in these realms will bring other contenders for power.